Experiencing Rheumatoid Arthritis: Happy Easter!! A very Happy and Blessed Easter! I came across this picture on the Internet and even though it is such a simple sign, it touched my heart. 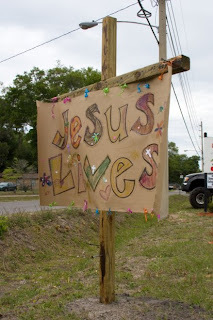 Yes, Jesus lives. It is that simple. No baskets full of exquisitely adorned Easter eggs, no tables laden with delicious food, no chocolate Easter bunnies, no other Easter ornaments, could express it better. Take a closer look at it. Notice the hearts, crosses and flowers? Did you see all those colorful ribbons attached on top and bottom? It is clearly the precious work of a child. A child, who put it's entire heart in creating this. I can just imagine it. The little head bend over, totally focused and concentrated on coloring the letters. The little tongue sticking out a bit, while trying to draw the best flowers ever. The feelings of love and devotion, while putting the hearts on the paper. This simple sign came right from the heart and it shows so well, that nothing man-made can even come close, to the wonderful gift God gave us. Therefore, let's bow our heads in humbleness and be grateful and thankful and celebrate all God has, is and still will be doing for us. But he said to them, “Do not be alarmed. You seek Jesus of Nazareth, who was crucified. He is risen! He is not here. See the place where they laid Him. i thank God that Jesus lives. our hope is not in vain. our Lord Jesus reigns... still. glory to God!